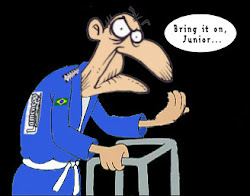 Old Man Jiu Jitsu is a blog about the humor and experiences of learning Brazilian Jiu Jitsu (BJJ) starting in 2009 at the age of 42. Learning BJJ over 40 is a great sport and experience. Brazilian Jiu Jitsu is efficient and quick at getting you into shape; intense and competitive; rewards technique over strength, and fun. It is also very difficult for those suffering from the post-tonal swelling of midlife (i.e., fatness). I train BJJ in Manassas VA under Dave Trader (Leo Dalla black belt) at Manassas Mixed Martials Arts (Manassas MMA). 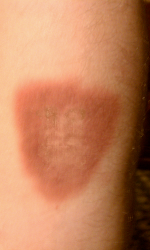 Other blog posts are about schools visited, interviews with BJJ celebrities, competitions, but mostly about the comedy of learning BJJ Over 40.